Leo Colovini เป็นที่รู้จักจากเกม Cartagena และ Carcassonne: The Discovery. Stefan Feld เป็นที่รู้จักจากเกมที่ใช้ลูกเต๋า เป้นผู้ออกแบบเกมอย่าง Castles of Burgundy และ Trajan aยังได้เสนอเข้าชิงรางวัล Spiel des Jahres. Reiner Knizia ออกแบบมากกว่า 200 เกม กลไกลหลักได้แก้ การประมูลใน Ra และ Modern Art การวางไทล์ ใน Tigris and Euphrates และ Ingenious การให้คะแนนที่ซับซ้อน จาก Samurai และการ์ดเกมอย่าง Lost Cities Schotten-Totten และ Blue Moon cooperative board game The Lord of the Rings. ↑ "German recreation: An affinity for rules?" The Economist, August 28, 2008. ↑ Jonathan Kay (January 21, 2018). 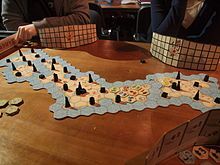 "The Invasion of the German Board Games". The Atlantic. สืบค้นเมื่อ January 30, 2018. ↑ 3.0 3.1 Bob Schwartz. "One Retailer's Perspective". ↑ "Glossary". Board Game Geek. BoardGameGeek. สืบค้นเมื่อ 19 October 2015. ↑ 5.0 5.1 5.2 5.3 Woods, Stuart (2009). Eurogames: The Design, Culture and Play of Modern European Board Games. McFarland. ISBN 0786467975. ↑ Donovan, Tristan (2017). It's All a Game: The History of Board Games from Monopoly to Settlers of Catan. Thomas Dunne Books. ISBN 1250082722. ↑ 7.0 7.1 Curry, Andrew (23 March 2009). "Monopoly Killer: Perfect German Board Game Redefines Genre". archive.wired.com. สืบค้นเมื่อ 27 May 2015. ↑ Harford, Tim (17 July 2010). "Why we still love board games". ft.com. FT Magazine. สืบค้นเมื่อ 27 May 2015. ↑ "Bruxelles 1893 Review – An Art Nouveau & Architecture Board Game". ↑ Stevens, DJ (2017-09-13). "Abandoning the screen for cardboard". ↑ Casey, Matt (2 October 2014). "Making better use of dice in games". สืบค้นเมื่อ 26 January 2016. ↑ Tinsman, Brian (2008). The Game Inventor's Guidebook: How to Invent and Sell Board Games, Card Games, Role-Playing Games, & Everything in Between!. Morgan James Publishing. ISBN 1600374476. หน้านี้แก้ไขล่าสุดเมื่อวันที่ 23 มีนาคม 2561 เวลา 20:56 น.